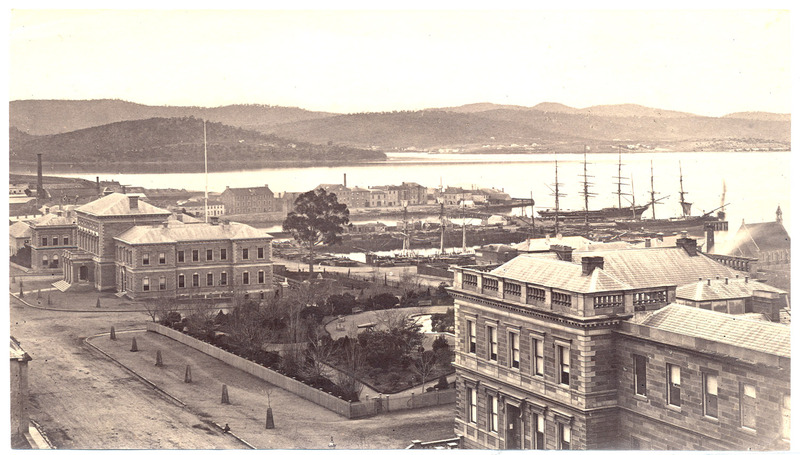 Walker, James Backhouse , Photograph of Franklin Square and Hobart waterfront c. 1870 , University of Tasmania Library Special and Rare Materials Collection, Australia. Photograph from the collection of James Backhouse Walker of Franklin Square and the Hobart waterfront taken in about 1870 possibly from St. David's Cathedral according to a note on the reverse. The photographer is Henry Hall Baily who had studios in Elizabeth and Liverpool Streets Hobart from 1865 until 1918. Reference: Tasmanian photographers 1840-1940 : a directory / by Chris Long ; edited by Gillian Winter. Hobart, Tas : Tasmanian Historical Research Association : Tasmanian Museum and Art Gallery, 1995.